The Chicken Farmers of Canada is responsible for chicken raised and sold commercially in Canada. It represents 2,800 farmers, and ensures that the chicken that reaches consumers table is safe, delicious, and raised to the highest standards: yours. If you're Canadian, there's a good chance you've spotted a "Raised by a Canadian Farmer" logo recently. This brand belongs to the Chicken Farmers of Canada, who represent more than 2,800 farmers across the country. "We work to make sure farmers' voices are being heard," said Marty Brett, Senior Corporate Communications Officer at the Chicken Farmers of Canada. "This involves sharing their stories through PR, advertising, consumer outreach programs, and social media campaigns." To navigate the changing landscape in Canadian media and to incorporate PR best practices, the association turned to Cision. Using Cision Communications Cloud®, a platform that pulls together all the capabilities needed to deliver world-class PR campaigns in a unified platform. Brett is equipped to find new audiences and keep tabs on loyal followers. The initial intent was to shift the association's focus away from "spray and pray" communications tactics and adopt a more targeted, individualized approach, which proved to be a challenge. "We need to stay connected with traditional media, and they're changing a lot." The association also sought to consolidate its PR and communications service providers. Using multiple solutions vendors made executing and evaluating campaigns a laborious task. "In addition to being more targeted, we wanted to be more efficient from both a cost and resource perspective," said Brett. 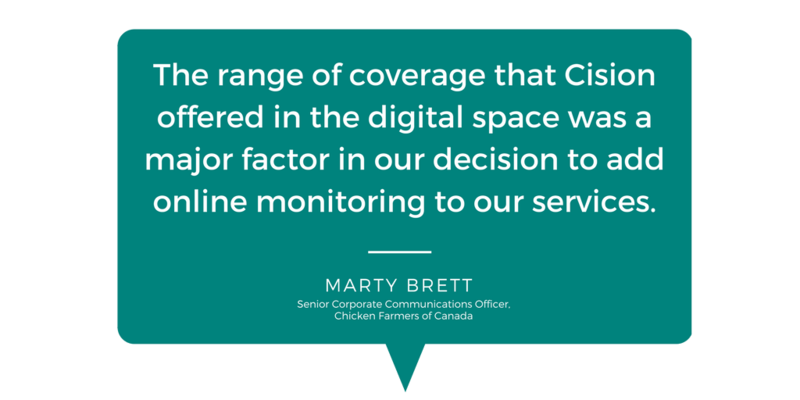 While the Chicken Farmers of Canada is a long-time user of Cision's Influencer Database, the team's recent upgrade to the Cision Communications Cloud has enabled them to combine their database and media monitoring requirements into the same platform. The association also typically distributes eight to twelves releases annually using Cision Distribution by Canada Newswire, also accessible within the platform. Cision's multi-channel monitoring tools enable communications professionals to determine who they have reached with their news release and earned media coverage, how their audience responded, what their competition is up to, what’s trending in their industry, and more. Within the new platform, one of the goals is to streamline this outreach process and to be able to have direct, targeted communications with interested media. There are a few reasons why the association decided to combine all of its communications solutions with Cision. "The service and range of coverage were big factors for us," said Brett. "Having our media monitoring and media relations (database) linked together has made our outreach and messaging more efficient. We now have multiple tools in our arsenal." Tailored and Targeted Work: The Cision Communications Cloud takes the guesswork out of deciding which media to target. "Instead of just putting out content and hoping that it will be looked at, we can proactively identify those who are already interested in our content," said Brett. "We are better able to track the frequency of coverage, and identify adversaries - and champions - for our key issues." Within the database, the team uses the "Talking About" search for keywords, phrases, and hashtags to gauge interest in their industry. The database contains editorial calendars, which help identify new content opportunities. More Digital Content: Brett's previous monitoring service covered print resources substantially, but missed a lot of digital coverage. "With the ongoing digitization of newsrooms, a lot less content is being printed, period," said Brett. Testing and Tracking Opportunities:The association has recently begun using Advanced Analytics, which takes its unique search terms and scores them based on prominence and impact, allowing the team to better understand the quality of its news mentions. "This really helps us see what else is going on - in and around the industry," said Brett. "The filters and keywords we can track will help us stay on top of trends and topics we may not have been following before." The team can also test more content to see what the media is interested in, now and in the future. "Media relations is not just about the now and today, it's all about building relationships," said Brett. The Chicken Farmers of Canada team is planning to shift its current outreach strategy to realize the benefits of upgraded Cision services. "We want to find new brand champions and take a more personalized approach to our outreach," said Brett. "We are just starting to use the new platform, but anticipate that we will be able to better channel our media outreach and be more targeted, all while cutting costs."